Wilhelm Augustus von Steuben, also known as Baron von Steuben, was born in 1730 in Magedeburg, Prussia (modern-day Germany). Von Steuben joined the Prussian Army at age 17, serving as a second lieutenant during the Seven Years' War. 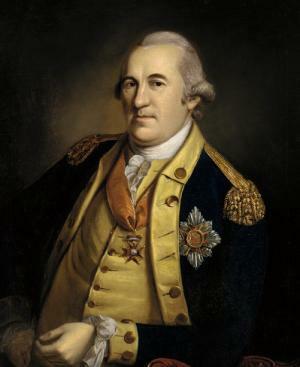 Von Steuben would continue to rise through the Prussian military, serving as first lieutenant, deputy quartermaster, captain, and eventually aide-de-camp to Frederick the Great. Following the conclusion of the war in 1763, von Steuben was discharged from the army. His military career would be renewed in an unlikely place 14 years later on December 1, 1777, when he arrived on American shores. Two months later, on February 23, 1778, von Steuben arrived in Valley Forge, where General George Washington appointed him as temporary Inspector General. Von Steuben&apos;s job was to inspect every aspect of the camp, setting standards for camp layouts and conduct. By May. But his real contributions were to military training. The Inspector General chose a unit of 100 men to be George Washington&apos;s Honor Guard. He trained them vigorously, then used them as a model example for the rest of the camp. His system of progressive training ensured that the men of the Army were ready for battle. The results spoke for themselves during the Battle of Barren Hill and Battle of Monmouth in 1778. His training regimen became the basis for Regulations for the Order and Discipline of the Troops of the United States, the guide that would serve the United States Army through the War of 1812. Von Steuben&apos;s military career would conclude in 1784 when he received his honorable discharge from the Army. He moved to New York where he lived until his death in 1794.